Make your staff training fun, exciting, and unforgettable! 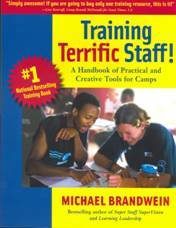 This lively, practical book by Michael Brandwein is loaded with almost 400 pages and over 40 chapters of ready-to-use tools to train and motivate staff for programs that serve youth. The best investment I’ve made in 15 years of camping is the purchase of this book. Every single thing we’ve used has worked wonderfully. Staff refer back to it in their work every day with kids! Simply awesome! If you are going to buy only one training resource, this is it! A wealth of easy to read and easy to teach information on practical skills. Our staff was able to customize training to fit their needs. A powerhouse of a book! All you need to run a successful staff training and development program is in this outstanding book! With its superb, ready-to-use reproducible materials, it should be required reading for everyone who trains staff or volunteers to work with children. A phenomenal resource. The step-by-step instructions make it easy to train people in an exciting and charismatic way. This outstanding, useful book has helped me captivate and inspire our staff! If you do not already have this outstanding book, I want to give you my highest recommendation that you get it right away!